Yes you heard me – days!!!!!! In my experience I have gone a number of days before needing to recharge the battery. If you haven’t heard DSD at 5.6 mhz – you haven’t heard the best in audio.This two track recorder is in my humble opinion the best analog recorder period.But the poor battery life is a pita – perhaps 2 hrs at most if you are recording at the highest setting. Well my tutorial will set you free of the shackles of poor battery life.You will need a soldering iron with solder,a length of power cable,heat shrink insulation,a 12 volt rechargeble sealed lead acid battery,some connectors for the battery terminals and the right connector tip to connect to the MR-1000 ( I used one that came with those universal power adaptors).That’s it.Now you just need a bit of DIY passion…………. You do this at you own risk but IMHO this is safe as I have used it for months now without problems.The MR-1000 actually uses 12v power from the mains power adaptor – see where we are going?When the rechargable battery runs out the MR-1000 inteligently switches to the built in battery pack.Cool hey…..With the right connections you can simply upgrade the battery life to as long as you like.I have chosen a YUASA 12 v 2.1 AH which fits perfectly in the bag.The battery can be purchased at MAPLINS in the UK.In fact all the parts are available at most DIY stores for probably less than £ 50. First solder the battery terminals taking note of polarity.Brown cable connects to red battery terminal.On the other end that connects to the MR-1000 – the inner prong is the positive(brown cable). Then make a little hole in the carry bag that corresponds to the hole where the power connector is on the bag ( I used the soldering iron hot so it sealed the hole). 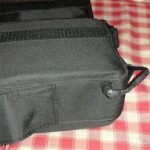 Make sure you have the orientation of the Korg correctly in the bag before doing this of course. Basically it’s not rocket science – solder the stuff end to end and when you are done – cover the ends with heat shrink.Mount the battery in the compartment of the bag and away you go.Perhaps unplug it when the recorder is not in use.Now go an record some amazing audio without any shackles.Peace and God bless – enjoy your Christmas everyone. Which charger do you use? How do you connect it to the battery after you’ve installed the adapter cable for the Korg? Do you use a mating connector from the charger to the connector attached to the battery? Do you place the battery in the bottom of the case? The battery charger for the sealed lead acid battery can be bought with the battery of choice at the store you purchase it from. That’s what I did. The battery terminals need to be soldered on to a single piece of wire – two cables – two terminlas and then to the connector for the MR-1000 – easy for someone handy with a soldering iron. 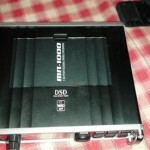 The charger charges the battery only and has nothing to do with the connections to the MR-1000.Check the pictures. 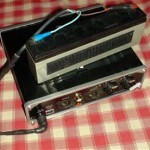 The mating connector to plug into the DSD recorder can be found in those universal laptop power adaptor packs. 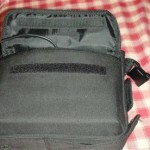 The battery sits on the outside compartment of the case where the flap is like the last pic. 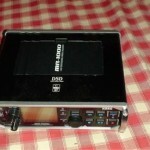 In fact Korg MR 1000 works on 6V. There’s a custom battery being built for mine but I wanted it to work for both my MixPre and MR1000 at the same time. But as I wanted it to shut down properly when the battery starts to get empty there will be modifications made – custom powering port for the battery. After long time I thought that I’d add my comment about modding my unit. MR1000 actually runs on 6V. As I use Sound Devices MixPre as a preamp for MR1000 I wanted it to have the same kind of Hirose 4pin connector for power supply. 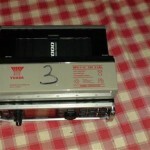 The unit was taken apart and inside the AA battery system actually sends in 2x6V. This is probably in case the battery gets empty and it could still shut itself down. At 1st just the power connector was made on the side of the unit. Then anomalies started to happen – high pitch noise came to the recordings when HDD started recording. That was probably caused by some electrical circulation – only occurred when both MixPre and MR1000 were run from the same battery. Then another simple modification was made – RF filters were added to all 3 internal power cables. That fixed the problem for me. I run it from 6V lead battery. 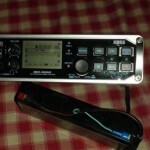 12Ah battery lasts for about 17 hours – the recorder itself can’t record for more than 6 hours straight. Hi, great to hear from you. My version runs on 12V. I could show you a picture but take my word for it. Plugging my battery in to where the power adaptor would plug would be 12V. Glad you got up and running. It is really a magic recorder and perhaps Korg did not realise the return. The quality is excellent but not everyone cares about that apart from perhaps music oriented folk. Yes, indeed it takes 12V from the back. I just wanted to run it from the other source (same as internal batteries) so that the recorder itself would know when the battery is starting to get empty and would shut itself down (just in case). I record nature and like to leave it there for as long as possible. Just considering this battery mod for my Korg–it looks like it has been working for people. Any problems or things to watch out for other than the instructions here? I’m thinking of having somebody else do it for me. I would leave the 8 batteries in there just in case the external one dies. You may lose data that way. So they are there just for insurance. Other than that – I have had no issues. Just make sure to charge overnight before a mission critical gig. Taavi who posted above has done the mod internally. Mine is external and when the external battery dies the internal batteries take over – and as they die – hopefully it shuts down properly. Hi–this is great! Can you tell me how you charge the battery? If I look online, does it come with a charger? And just out of curiosity, how long did your 8 rechargeable double A’s last when recording? A battery store suggested that this battery is about the same amount of power as the double A’s. Just wondering why it lasts so much longer?Thanks for your help! As mentioned in my post the internal 8 batteries go for maybe two hours. That pictured battery lasts a few hours only but there is no special limit on a 12v battery ( even a car battery if you need it ) so you can determine the capacity simply by the size you buy. That pictured one certainly doesn’t last for days but there is nothing stopping you from getting one that can do that job. The main focus of my MOD is to allow the possibility to go as long as needed. Most of my sampling sessions last a few minutes so I don’t need the big batteries but I do have the 12AH version – have 3 in fact. So technically could use it for days without a hiccup. I have powered a small Brix computer for 10 hours straight this way and that was running hot – this should last a full day perhaps. The charger is purchased separately. Hi Henry–just saw this post. Thanks. Would you mind posting the name of the battery you are using? The links don’t work. Or would I do a search for a 12AH sealed battery? I’m in Canada so will look locally… I know nothing about these things, so, sorry if it is obvious! 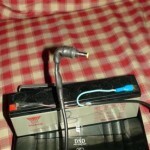 Any 12 V battery with appropriate power lead/jack. The Power Gorilla would work great with this.